Sera Gamble promised that we were going back to basics this season and this episode proved it. 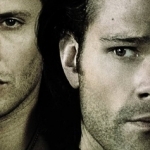 We had the old favorites of comedy and drama and a case to work through, interspersed with this new path that the Winchester brothers are on. If this is what I’ll get to expect from the season, I’m totally on board. Dean’s trying really hard to keep his family safe. He’s even gone so far as to move Lisa and Ben to a new home in hopes that the monsters that are after him will leave them alone. However, even he doesn’t believe that, so he’s keeping them on lock down. Not a very harmonious living situation, but he’s doing the best he can. It’s still a constant struggle between would they be safer if he weren’t there or would they be safer if he were always there? It’s a lose-lose situation the way he’s trying to balance everything. And he wants to stay out of hunting, but he can’t because he’s being drawn in over and over again. This time, it’s a case that he can’t turn down. 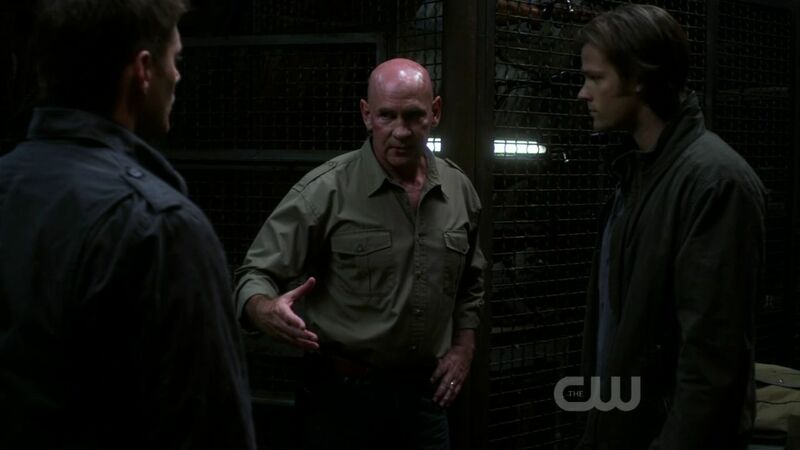 The case is one that Sam’s working on alone, since Dean’s trying to stay out of the hunt. Parents are being murdered and their babies are kidnapped from their homes, never to be seen again. Perfectly typical case for a Winchester, perhaps not even supernatural, but then it takes an atypical turn when Sam finds a baby hidden away at one of the crime scenes. And what is his immediate reaction? Not to call up Grandpa or one of the cousins that he’s been working with for a year now. No, Sam calls his big brother because he needs help and Dean’s the one to give it. 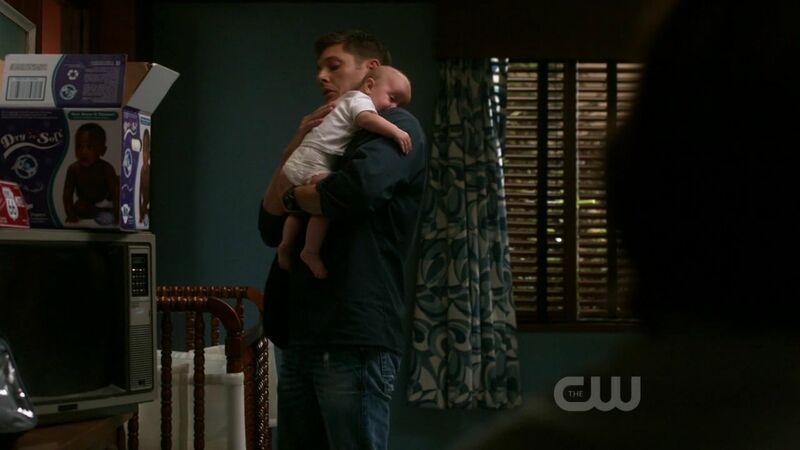 You combine Dean and babies and you make me ecstatic. But let’s push that adoration aside and focus on the comedic aspect rooted in the fact that neither he nor Sam really knows what they’re doing. The scene in the grocery store when they’re trying to get supplies, yet clueless on how to make the child stop crying? This is the comedy that Supernatural is known for. That’s coupled with the character-building and realization that Dean does know a thing or two about taking care of children when hard-pressed because he’s been a father and a pseudo-uncle for the past year. Remember, the last time he did this was when he was four and taking care of Sammy, so he needed some refreshers. 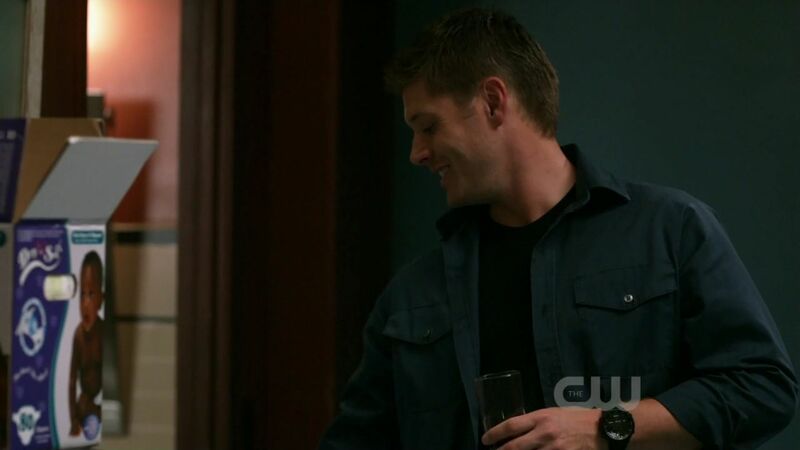 Perhaps putting booze in the baby’s mouth to make him quiet down and go to sleep is not the best course of action, but it’s very funny and a typical Dean Winchester thing to do. 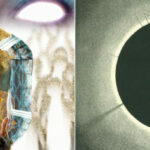 No one realized that shape-shifters procreated, so we’re learning more and more about the family dynamic of the monsters they’ve been hunting all these years. The little baby shape-shifter is just ultra-cute. And when he switches to be the baby from the diaper package? Even more cute. He’s just an adorable little monster. Yet the question remains of what to do with him because he has no place in the outside world. Normal society could not accept a child who can randomly switch physical traits, gender, or even nationality. 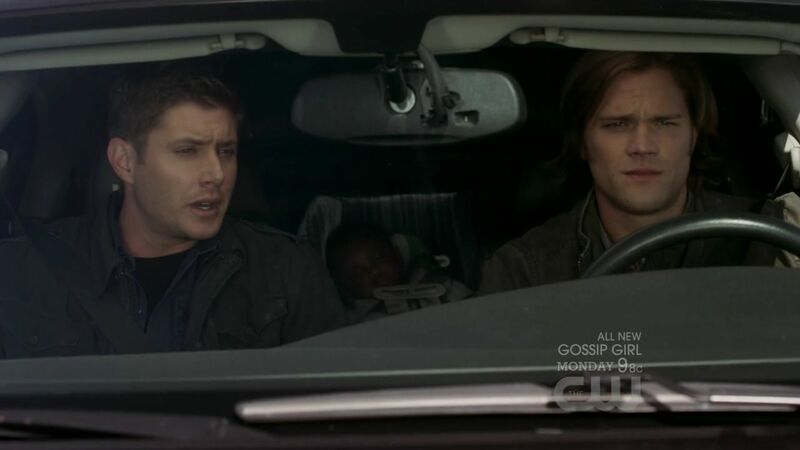 So they take the baby to the Campbells, since Sam thinks Grandpa will surely know what to do. Dean doesn’t trust this family, I certainly don’t trust this family, and with Samuel’s solution of letting Christian raise the child so that they can make him a hunter, it just ups the level of distrust. This is not an ideal upbringing for anyone, least of which a a baby shape-shifter. The Campbells and Dean are in two totally different realms of thinking at this point and Sam’s trying to run interference for both of them. He wants to trust the Campbells, since it’s his family and that’s important to him, but then there’s Dean on the opposite side who is his brother and loves him no matter what and has died for him. It’s a delicate position to be in. We as the audience know not to trust Grandpa, as the last scene with him revealed. Who was he on the phone with, working for? It can’t be good, it’s never good. So, yeah, in the Campbell versus Winchester debate, I’m siding with Dean. I find it very telling that Sam named the child after their father and Dean named the child after their adoptive father. And thus, Bobby John came to be. And the child is a jumping off point for the heart-to-heart that Sam and Dean have in terms of family obligations. Dean’s trying to be a good father and a good provider for Lisa and Ben, yet Sam points out the obvious that Dean’s becoming their father. He’s taking the exact same steps that he swore he hated being imposed on him growing up. It’s never going to be just one more hunt and it’s never going to be deemed safe enough, so instead he’s starting the cycle and it’s not going to end well. I wholeheartedly appreciate that Lisa took that decision out of his hands. It doesn’t have to be an all or nothing, he can have both. Hunting is in his blood, he has to do it, yet she understands that it doesn’t mean he loves them any less. She’s willing to let him go if he promises to come back. It’s a win-win situation and the only way it could have gone down. Now Dean can be free to hunt and not feel guilty about it. He’s also got a home base that he can come back to. He needs it and the audience needs it as well. And with the strains of Dean Winchester’s lullaby, “Smoke on the Water,” playing in the background, we get the unveiling of the Impala. Dean’s face when he uncovers his baby is just mesmerizing. He’s truly happy, for the first time in more than a year, and it’s because he’s back to being who he’s meant to be. Dean and the Impala, with Sammy hopefully riding shotgun in the near future, hunting down monsters and making the world a little less crazy along the way. This is what Supernatural‘s all about. 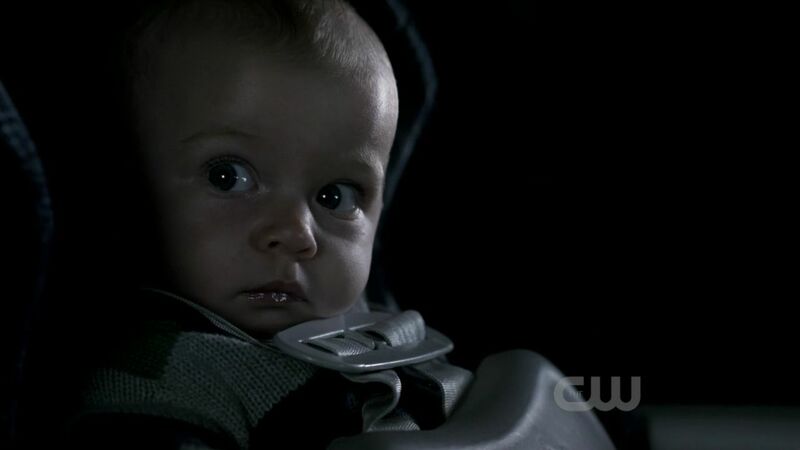 Dean disnt give a good or better plan to deal with the baby so his mistrust of the Campbells doesnt quite make sense as he barely knows them.But I did like this one much more than the premier but as of now we need to give Sam some attention after all he did die sacriice himself and come back didnt he because it seems it was a dream that didnt happen?. I love your reviews and always read them, yet never comment because I’m a chronic lurker but I just had to pipe in with a little note. I hope you don’t think me terribly nitpicky, but when you say, “a child who can randomly switch physical traits, gender, or even nationality”, I don’t think “nationality” is the word you’re looking for, (which has nothing to do with appearance and everything to do with a country’s legalities), but rather (apparent-)ethnicity. To reiterate: I love your reviews, and I’m sorry this is the first time I’ve commented. Yes, but they give off the air of distrust (in Dean’s eyes). As he said, he seems to be the only one that wants to know how Sam and Samuel are suddenly back. And I have to agree with him. Both Sam and Samuel (for different reasons) are focusing more on the Alpha hunts than their resurrections. Thank you very much. I hope you continue to comment throughout the season! The Campbells are sneaky! 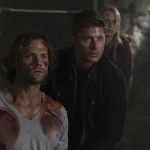 They are hiding things from Dean and they are hiding things from Sam–thus the reason Samuel sent Sam down into the panic room with Dean. I guess he didn’t want him to know that he was going to dart the shapeshifter and keep it rather than kill it? Who was he talking to on the phone? He said that he lost *3* people? I saw Cousin Mark bite it, who were the other 2? The grocery store scene was one of the funniest SPN scenes of all time–quite possibly the funniest. I loved Sam’s “Make it stop Dean!” and I loved the fact that Dean knew they had about 2 min. before the baby was about to erupt into tears. Dean has always been of the belief that if its a monster, you kill it, no questions asked. It was interesting to see him conflicted about this practice when it came to the monster being a baby. It wasn’t so easy for him. Is that because he’s spent a year out of hunting and living with Lisa & Ben or are we seeing a new Dean Winchester? I love Sam’s car! 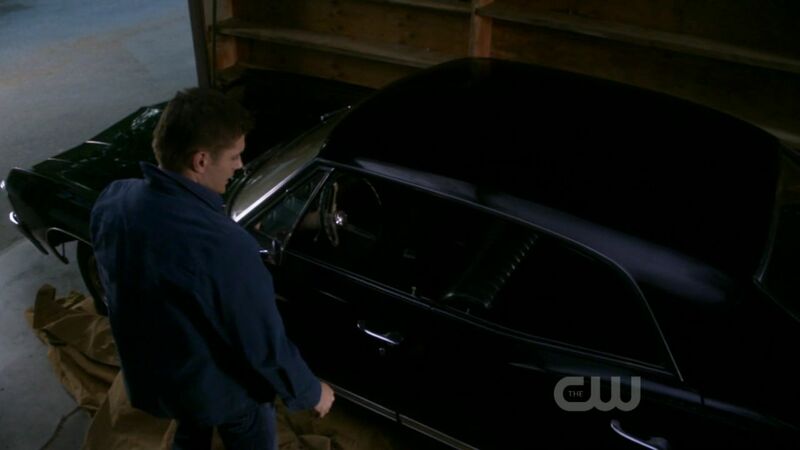 I want the boys back in the Impala, but I do love Sam’s car. Can’t wait for next week! I want to see shirtless Sam doing chin-ups! Dean used to be that way (very clear-cut, evil vs good) but it’s interesting to see how he’s changed a bit over the years. He’s not longer like Gordon, there are alot of gray areas now. Sam, however, is back to how Dean used to be in the first season, so they’ve essentially flipped (which I enjoy). As Kimblery says, he’s changed. The earliest solid evidence of this that I can remember is in “Blood Lust” when talking about letting the vampire Lenore and her troop go. Plus there’s the more current evidence of him at least putting up with Ruby for the most part, teaming up with Crowley, etc. (although him going against Sam, who is very much in the “don’t kill the monster unless you have to” camp in “Metamorphosis” is an interesting contrast). Sam: Yeah, Dean, but you didn’t. And that’s what matters. …I seem to have gone overboard with the thinky-thought sharing there, so sorry for the long comment. And I’ve always found Dean and Sam’s changes to be fascinating. They have been evolving and changing since we began watching them. It’s like a circle and they’ve come to the point where they’re in a similar position and mindset as their brother was five years ago.